One of the worst parts of "economic development", a.k.a., corporate welfare, is that it creates a habit that is hard to break. Businesses get used to being able to ask for subsidies, special tax breaks and government loans that neutralize the credit market's risk assessments. This in turn has led to an increased interest in political influence from the business community, including lobbying and campaign contributions. This is not a freedom-of-speech issue: nobody should ever suggest that business owners and managers have less of a right to it than the rest of the American people. This is about the long-term consequences of blurring the line between private enterprise and political power. Economically, the effect of this informal fusion of the two will be similar to what we have seen on the individual side of the private sector. Back in the 1970s, when Europe's welfare states had reached a high level of maturity, family life essentially became integrated with government, as people depended on the political machinery for everything from health care and their children's education to lifelong income security. Consequently, people have adjusted their entire lives to what government provides, but also takes from them in the form of taxes. With a welfare state that takes in, redistributes and spends up to half the economy, it is practically impossible to live your life without being affected by government. Since the American welfare state is smaller, its presence in people's lives is less intrusive, at least for now. The problem on the corporate side is steadily growing, driven by the destructive interaction between corporate welfare on the one hand and lobbying and campaign contributions on the other. Again, this is not an argument against businesses donating to political causes and candidates - the point is that if government did not use taxpayers' money to pick winners and losers, there would be no interest in the business community of influencing elections. As I mentioned in an earlier article, corporate welfare is at least in part being motivated by the idea that government needs to somehow lead the diversification of the economy. From an economic viewpoint, there are two problems with this argument. First, the pursuit of diversification creates distortions effects in the economy: winners picked by government are able to operate above the laws of the free market and therefore attract an artificially large amount of venture capital. The risks that come with a government-sponsored venture are concealed to investors - as exemplified by the crumbling Tesla scam - which draws money away from business ventures that have been properly vetted by the free market. 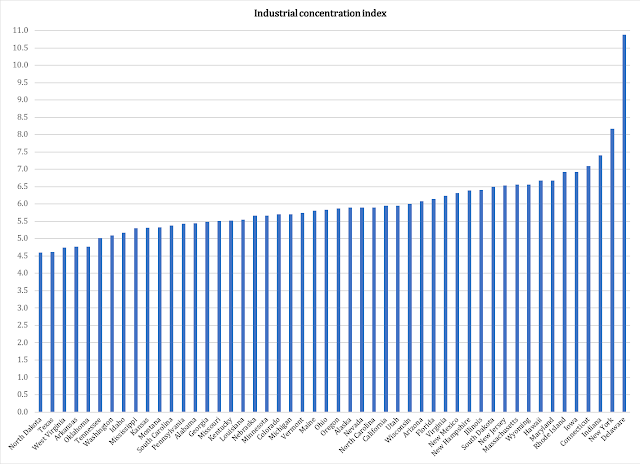 Secondly, those who suggest that states need more industrial diversity are sometimes correct in the argument per se - a handful of states suffer from pronounced industrial concentration - but their solution is all wrong. Furthermore, the need for economic diversification has declined generally in our country, as the industrial structure of our economy has become more pluralistic over the years. A look at our states confirms that the need for economic diversification is much smaller than spending on corporate welfare seems to suggest. Before we get to the state data we need to make a methodological note. The national data we reviewed were based on employment, reporting in what industries Americans work. The same data is available at the state level, but the processing of such a great volume of data is prohibitively expensive in terms of time. Therefore, a look at the industrial structure at the state level will be based on GDP data. This means that the numbers reported below cannot be aggregated into the same structural composition that I reported in the article about the national economy. Gross domestic product data by industry reports the value of production. This value, in turn, is the broadest possible tax base in an economy, a point worth keeping in mind in a conversation about corporate welfare. The argument for economic diversification is, namely, almost always founded in the notion that governments need more tax revenue and that a more diverse economy will mean more GDP growth and therefore a bigger tax base. There are two important findings in the data on the industrial composition of our states. The first is that the financial industry is a big provider of economic value: in 38 states, the financial industry is the largest. This may seem surprising, given what we conventionally think of as "financial" corporations. However, in addition to traditional finance, this industry also includes insurance, real estate (though not management, which belongs in a different industry), and the rental and leasing of property. Of the 38 states where the financial industry is the largest, in six of them it produces more than a quarter of the economy (based on 2017 state GDP data from the Bureau of Economic Analysis): Delaware (45.7 percent), New York (32.4), Connecticut (27.6), Rhode Island (26.1), Iowa (25.2) and South Dakota (25.1). Manufacturing is the largest industry in six states: Indiana (28.6), Oregon (20.0), Louisiana (19.7), Michigan (19.1), Kentucky (18.5), and Alabama (17.3). The auto industry is an obvious explanation of the dominance in Michigan, but it also has a large presence in Indiana, Kentucky and Alabama. However, it is important to keep in mind that America does manufacture other things as well... Oregon is a good example: thanks to migration north from California in the earlier days of Silicon Valley, a lot of computer products are manufactured in the Beaver State. Given the aspirations of Oregon's state lawmakers in recent years to catch up with California taxes, it remains to be seen how long that will last. In one state, mining is the biggest contributor of economic value. Hardly surprising, that state is Wyoming where 23.3 percent of the state economy originates in the extraction of natural resources. This share is smaller than one is often led to believe, given the political debate in Wyoming. In other words, the first finding regarding state industrial structure is that the financial industry leads in 38 states. It is among the top three in the other 12 states. The second finding is that government has a big presence in the economy. Its production of economic value (yes, technically government produces economic value by providing services; that is not a normative judgment, just a fact) is the largest in New Mexico where it is responsible for 22.8 percent of GDP. After the Enchantment State follow Alaska (20.0), Mississippi (17.0), Oklahoma (15.8) and West Virginia (15.6). Overall, government is one of the three biggest industries in 42 states; in the remaining eight, it ranks fourth. This is not necessarily for the better of the economy: to produce all this economic value, government needs a lot of tax revenue. Since higher taxes depress the private sector, especially over time, the more government grows, the more it pushes other industries to the side. This makes the rise of government as a "provider of economic value" a self-fulfilling prophecy. It may be surprising to see that West Virginia is one of the most diversified economies in the country, given that the state is home to a large portion of the nation's coal mining. However, in 2017 mining was only 12.9 percent of the state's economy, with finance in second place with 13.5 percent. Government was West Virginia's largest industry, being responsible for 15.6 percent of state GDP. This is ostensibly the result of the Obama administration's hostility toward coal mining. 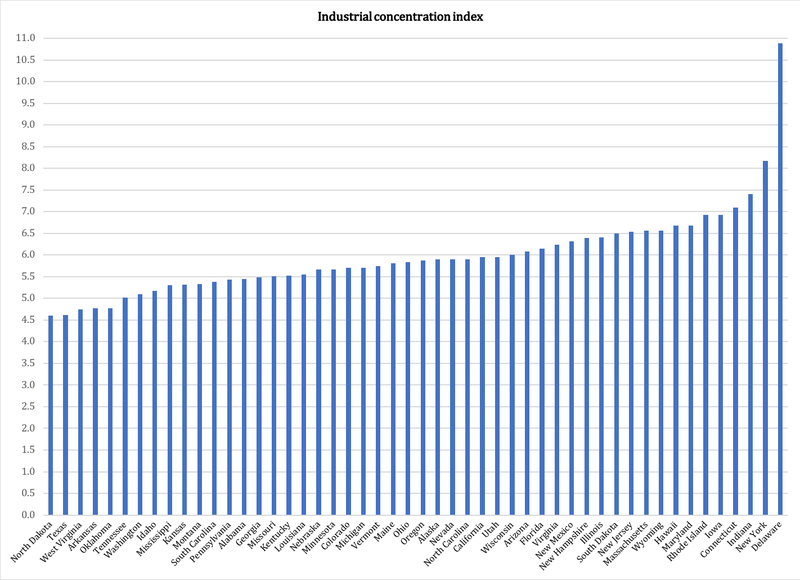 West Virginia scores well on the industrial concentration index for two reasons: its dominant industry is a comparatively small part of the economy, and the top three only represent 42 percent of state GDP. For comparison, in Delaware - the most concentrated state in the country - the largest industry, finance, produces 45.7 percent of state GDP; the second-largest industry, professional and business services, add 11.6 percent and government 9.8 percent. In total they produce two thirds of Delaware's GDP. Overall, there is a fair amount of economic diversity in our states. It is not reasonable to motivate corporate welfare with the need for industrial pluralism. What we do need, though, is to take seriously the problem that government is one of the three largest industries in 42 states, and fourth in the remaining eight. This explains very well why our states are in fiscal trouble - and why they will fall even deeper into trouble if government keeps growing.